The steps for writing brainstorming on the previous page are simple and easy to understand but sometimes some additional techniques may help when you are stuck. Writing brainstorming is just a group of exercises and techniques for coming up with ideas to write about. Writers' Block, or just not knowing what to say, has troubled just about every professional writer and every student at one time or another. Overcoming the Block can take some time but it can be done. The following are just a few of the techniques that have been successful. You may also find the strategy at ielts-useful-tips.com helpful. Good ideas don't always come to us when we need them, they may come at other times. Be prepared with a way of recording and remembering them. It makes no difference whether you use a small notebook and pen to write with, save a text message for yourself on your cell phone, send yourself an email or even use a mini-recorder, just make a reminder so you don't forget your inspiration. Don't let that good idea get away from you, be prepared to save it from the time you wake up in the morning until you're about to fall asleep at night. When you find yourself with a blank piece of paper or a white computer screen in front of you and no idea of what to write, do something different for a few minutes. Physical exercise is important for mental activity, get some fresh blood flowing through your brain with a walk around the block or some other exercise. Don't forget to take your pen and notebook along for when you have an idea and don't forget to go back to your writing. If you ever have a good idea for your writing but are having trouble getting started, don't worry, just start your writing in the middle. Write the parts that you're interested in first then go back to the introduction later. Freewriting is a way of getting the brain in gear. Think of it as a stretching exercise before some game or activity. Write a word or a topic at the top of an empty page. Set a clock for five or ten minutes and start writing. Write as fast as you can; the faster the better. 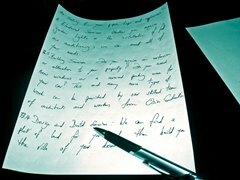 Don't stop writing! If you don't know what to say, write that you don't know what to say. Write: "I don't know what to say but I'll think of something soon." Don't stop. Don't worry about grammar, spelling, style or anything else, just Don't Stop. Don't make any judgments about what you write. You may write some pretty strange things while doing this , but don't stop and don't worry about what you say. No one else ever has to see it. It's all right if you get off the subject. Your imagination may take you somewhere strange. Just keep up the writing brainstorming. Do not criticize yourself and do not cross-out or revise in any way. 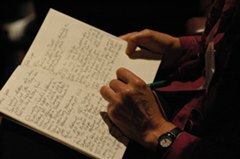 At the end of the freewriting you are into the routine of writing and you may have had some interesting ideas. Try reading out loud what you have put down (or even have a friend read it to you.) Some ideas sound better than they look on the paper.